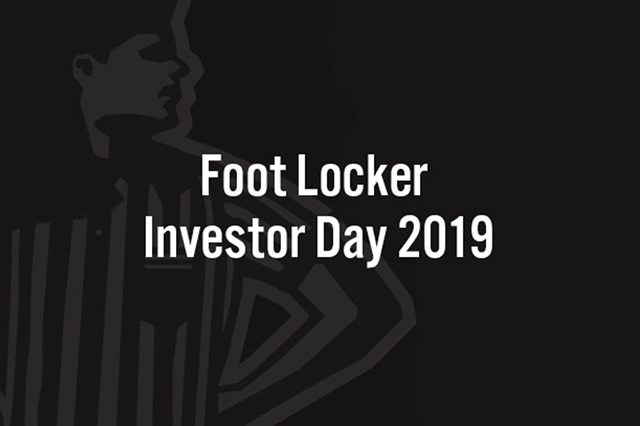 On March 28, 2019, Foot Locker hosted its investor day. The company focused on its customer-connected strategic framework, strategic initiatives, international expansion plan, Power Store portfolio optimization and five-year financial outlook. 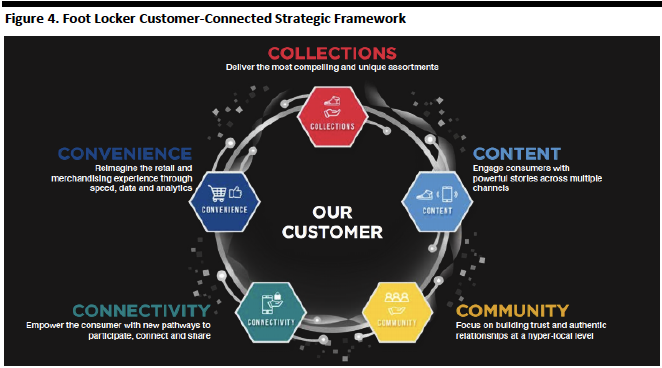 Outlined its customer-connected strategic framework spanning collections, content, community, connectivity and convenience. Said it is investing in physical and digital experiences with the goal of elevating the customer experience. Outlined plans to continue to expand into Asia. Provided its five-year outlook — it aims to grow sales at a compound annual growth rate in the mid-single digits, and it is targeting sales per gross square foot of $525-575. In 2015, Foot Locker set a long-term sales target of $10 billion; the company’s sales in 2018 were $7.9 billion. 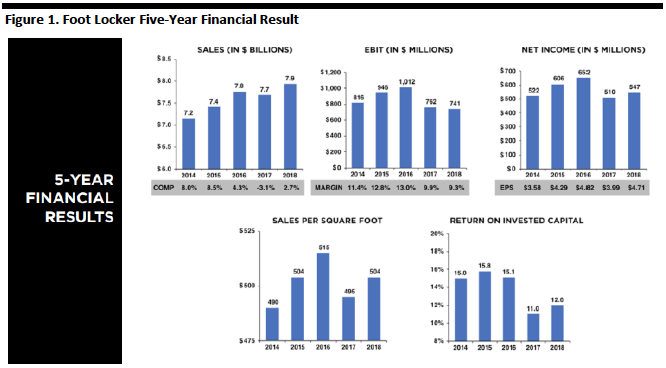 In 2015, Foot Locker set a long-term target of sales per gross square foot of $600; the company’s sales per square foot in 2018 were $504. The customer is changing, moving faster and is digitally connected. Management commented that technology is changing how today’s consumer interacts with the world and how they engage with brands. Customers demand authenticity and newness from brands – and at faster-than-ever speeds. Social media has become a source of social currency for customers as they seek to share moments and their personal style from concerts, festivals and culinary experiences. The Foot Locker customer uses sneaker choices and clothing choices to tell a story about who they are. 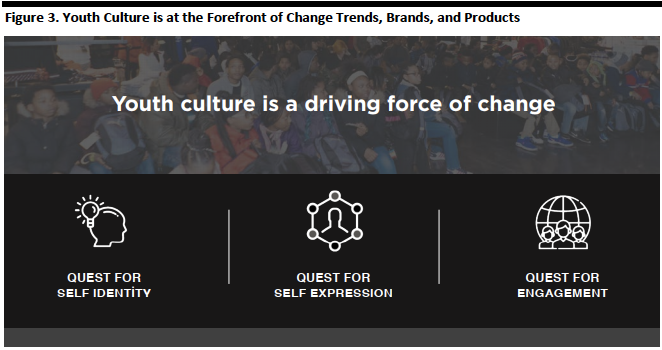 Foot Locker outlined its customer-connected strategic framework which the company created to focus the Foot Locker team on the customer. “Collections” leverage vendor partnerships, internal talent and capabilities and external investments to create unique and powerful assortments that elevate the sneaker business. “Content” storytells around the product and builds an emotional connection with consumers across multiple channels. Foot Locker is using key influencers, celebrities and new initiatives to drive excitement and build shareable moments. 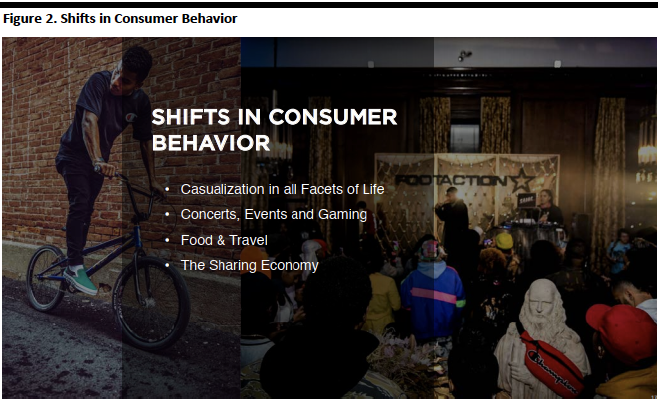 “Community” taps into consumers’ passions and interests, and delivers innovative experiences around them. The goal is to build authentic relationships with the customer at the local level. “Connectivity” enables today’s consumer to connect outside the physical store. Consumers do not distinguish between a physical and a digital experience. The company is leveraging data analytics, digital technology and a team of people to empower the customer with ways to participate, share and engage. “Convenience” helps meet expectations around speed, product, content and experiences – delivered on the consumers’ terms. 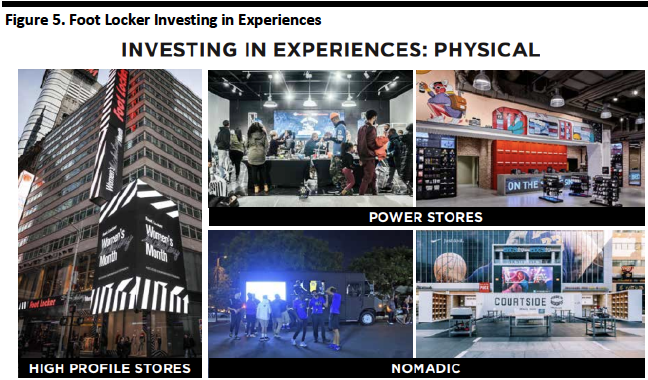 Foot Locker is investing in physical experiences with the goal of “driving community across key commercial cities” across the globe. The company said it seeks to engage and serve its customers to develop authentic and meaningful relationships. As part of this initiative, the company has opened Power Store formats. The Power Store includes unique features such as locally designed exterior and interior artwork, locally sourced store and marketing teams and locally sourced brands. Each store also features dedicated space, merchandised with footwear, apparel and accessories for women and kids. There are activation spaces within the Power Stores that highlight new Foot Locker partnerships, including Xbox gaming, local hairstylists and community activations. The company’s first Power Store opened in Liverpool, England, with subsequent stores in London, Hong Kong, Detroit and Philadelphia. By 2023, Foot Locker expects to operate a total of 200 Power Stores. Currently, there are five. The company expects its net store count to be up by a low-single-digit percentage as Foot Locker offsets new store investments with some closures. As Power Stores scale, there is an opportunity to optimize store portfolio performance through an improved balance of malls versus off-mall stores – approximately 80% of the company’s stores were in malls in 2018 compared to less than 70% projected by 2023. 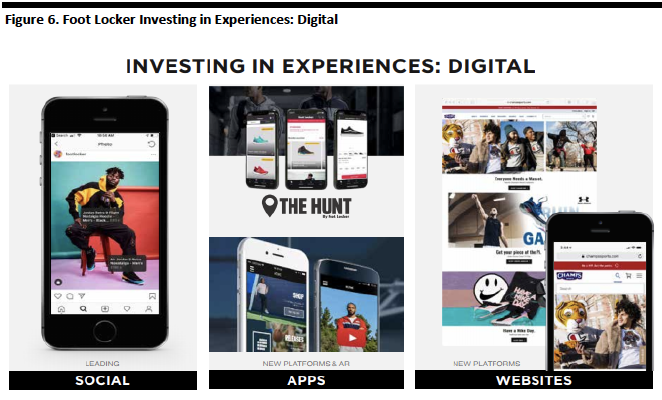 Foot Locker is investing in digital experiences: On average, over 80% of web traffic originates from mobile devices or apps. The company is investing in re-platforming its North American websites to make them responsive to different form factors and mobile devices, and the new platform has improved navigation and increased page load speeds, which drives higher conversion rates. In 2019, the technology team will take the platform to Europe and Asia Pacific. 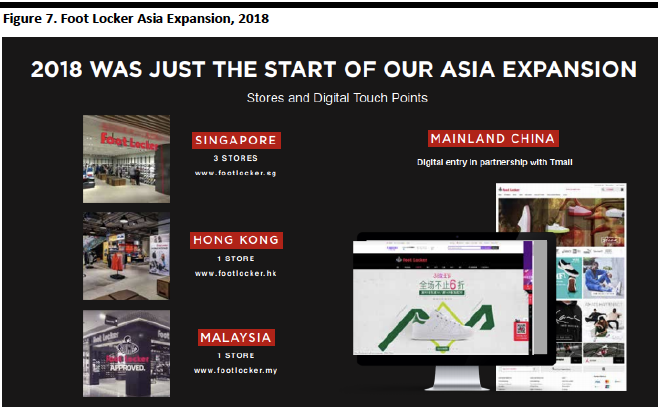 In 2018, Foot Locker began expanding across Asia with an omnichannel activation strategy. The company finished 2018 with three stores and an ecommerce site in Singapore, one store in Malaysia, and one Power Store in Hong Kong. 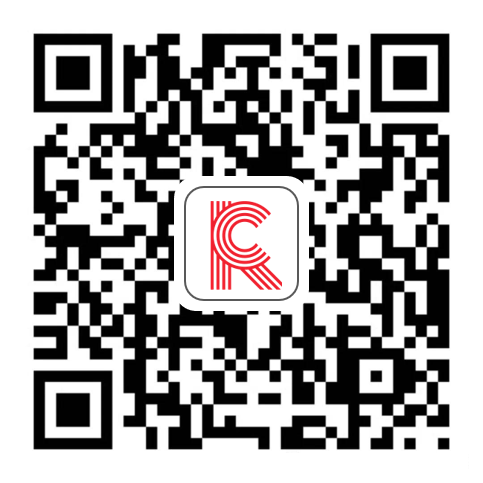 In China, the company also entered into a partnership with Tmall in to understand the Chinese consumer. Management reported Foot Locker will evaluate the company’s opportunities in these targeted countries and begin to expand in metro areas and cities, leveraging its leadership teams in Asia. Foot Locker reiterated its guidance for the full year, calling for mid-single-digit comp gains and further indicated that the company expects mid-single-digit comps quarterly. The company reiterated full year EPS growth in the double digits. For the company’s five-year outlook, it projects sales at a compound annual growth rate in the mid-single digits. The company’s CAGR from 2014 to 2018 was 1.9%. 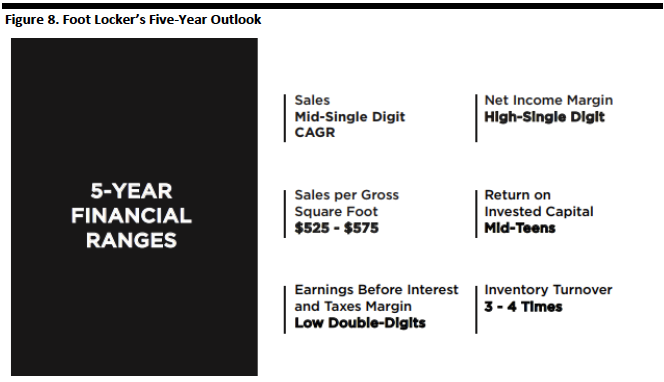 The company projects its sales per gross square feet to be $525-$575 for its five-year outlook. In 2018, the company reported sales per square feet of $504. The company projects EBIT to be in the low double digits; in 2018, the company reported EBIT of 9.4%. The company projects net income margin to be in high single digits; in 2018, the company reported net income margin of 0.6%. The company projects its return on invested capital to be in the mid-teens; in 2018, the company reported a return on invested capital of 12%.